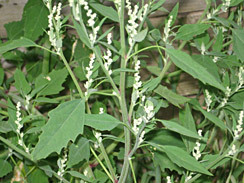 Lamb’s quarters are one of the best-known and most nutritious wild edible greens. They’re know by several names: lamb’s-quarters, pigweed, goose foot and wild spinach, and the botanical name Chenopodium album. Their leaf shape resembles a goose foot, and in fact they’re part of the goosefoot family of annual herbs. Archeological evidence suggests it’s been foraged for nearly 9000 years and domesticated for nearly 4000. Still cultivated today in countries including Mexico, it’s a serious helper plant to humans. This plant can take on different looks depending on growing cycle and location. 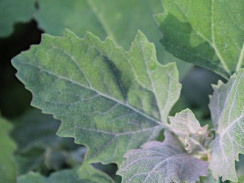 Leaves near shade or water seem to grow much larger, up to 3″ long, while sunny patches tend toward smaller leaves the size of my thumbnail, growing in prolific 2′-tall patches. It seems like the smaller leaves tend to have reddish stems. The leaf’s top side is brighter green than the underside, which is usually paler and lighter, sometimes a mild silvery gray green. Seeds grow along long skinny shafts shooting out from the plant’s top. Lamb’s quarters are a lot like spinach in taste and nutrition, and can be used like spinach. Eat it raw in salads or steamed/sautéed, etc. They’re low in calories but high in protein, iron and vitamins A & C. The prolific seeds can be grinded into a dark flour for making bread, gruel, tortillas, etc. 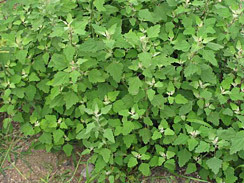 Wash lamb’s quarters, mallow and mustard leaves, remove stems. Slice in 1/4″ strips. Mince sage and sticky monkey flower leaves, dice garlic. Beat eggs in bowl. Heat large skillet on medium flame. Add touch of butter, allow to melt (not burn), then mustard leaves, sautéing 30-60 seconds. Add mallow and lamb’s quarters, sautéing another 60 seconds. Scatter 1 tsp water in pan, sauté another 20 seconds, then remove greens to plate. Add 1 tsp butter, allow to warm and bubble, then add sticky monkey flower leaves and black sage, sautéing 30 seconds, then add garlic, sautéing another 30 seconds. Add 1/2 tsp butter to skillet, allowing to warm, then add beaten eggs. Sprinkle with salt, freshly ground black pepper, mustard seed. 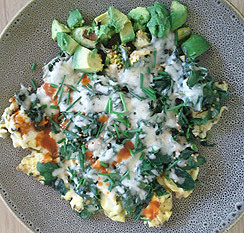 Scramble until eggs are solid, then spread evenly across skillet. Increase flame to medium high, searing egg bottoms for 20-60 seconds for last-minute browning. Remove from heat (or turn off flame), then layer previously cooked leaves evenly across eggs. Sprinkle cheese on top, then place lid on skillet. Drop 1/2 tsp water near hot edges of skillet to the side of the eggs, cover with skillet lid, allowing heat/steam to melt cheese. Wait at least 2 minutes, then remove to serving dish, garnishing with chopped chives and diced avocado. Bon appetite. * Sticky Monkey Flower leaves differ from Monkey Flower leaves. See sticky monkey flower section below.